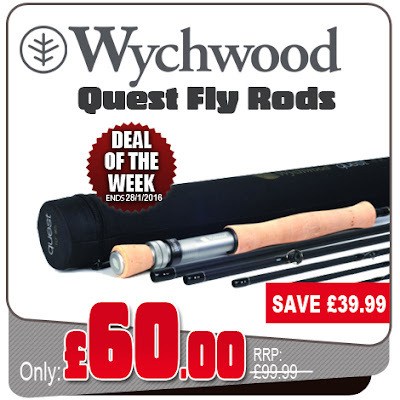 The Wychwood Quest Fly Rod, in either 8ft6 #4 or 9ft #5 is the ideal piece of kit when you fancy going off road to explore a hill loch or if you need a compact fly rod that easily fits into a tackle bag or rucksack. With the Quest being 6 piece, its also the fly angler's ideal partner when on a cross-country trip to a fishery and light enough for a trip to an exotic location - it takes up no room in your suitcase at all! The Quest Fly Rod features a saltwater-proof reel seat, premium grade cork handle and a thin lightweight and responsive blank that easily loads for easy fly casting. The rod is also finished in a non-flash blank and dark chrome guides so there's less chance of spooking your quarry, yet it has all the styling and class of a rod at a much higher price point. So with the Quest, you are opening up loads of possibilities to go exploring remote locations, rivers, streams and lochs. Grab one for your rucksack or fishing bag and start your Quest to become a more adventurous fly angler today.